I first connected with the internet seriously in the early part of this century, and immersed myself in online communities and cultures. Along the way, I discovered Furries. Now, the Furry Community was one of the friendliest, but also one of the most mocked, on the internet at the time – and they possibly are still rather misunderstood today. I created a Fursona (Furry persona), put up auctions for both stories and art on Furbid, and shared my art via VCL, spending most of my time on Yerf’s forums (but lacking in the artistic ability to actually become a member). Sadly, all of those sites are now long defunct, VCL has been archived, but is still viewable, Yerf has vanished altogether and Furbid has been replaced by Furbuy, which seems to attract sellers but not-so-many buyers. And truth be told, my art was somewhat substandard at the time and most of the auctions were purchased by the same fellow, a fellow how probably kept most of lower-tier artists afloat. Now, whilst I enjoy drawing animal people – as has been noted in previous entries, I favour animal, or animalistic, characters over humans – I have never believed that I actually was the spirit of a lemur trapped in a human’s body, nor have I ever engaged in anything dubious or dodgy, either wearing a fursuit or not. I just prefer drawing, and writing, animal characters to humans. I have a vast cast of Furry characters, beginning with Kataryna Delilah Lemusu, a ring-tailed lemur. 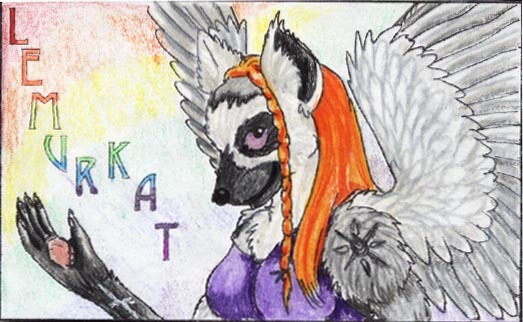 Kataryna began life as a regular ring-tailed lemur-morph: brownish-red fur, white belly, long striped tail. Then one day, in a fit of artistic angst, I killed her off. Slashed her wrists in the bathtub, in fact. I’m not sure what happened to that illustration – it’s probably lying around in a drawer somewhere – but anyhow, she was unable to stay dead: Anubis sent her back from the Afterlife, tasking her with the duty of helping others, and saving other people’s lives. She was reborn, as an angel. For a few months, I actually wrote her story as a serial via Livejournal (also now largely defunct, as the users all migrated to Facebook) and have archived it on my Fictionpress site, if you want to read it (it’s poorly edited, sorry). Naturally, I never quite got around to finishing it. I was too fickle in my writing, and I don’t think I finished a single story between 2000-2008 (when I wrote, finished, edited and, eventually, published, Midsummer Knight’s Quest). Despite not being finished, it did spawn a sequel, Scavengers of the Deadlands (also unfinished) which you can read the first ten-or-so chapters of here. One day I shall finish them … one day! Although I did move away from the Furry forums around 2005 (and shortly after, Yerf closed, the two events are entirely unrelated), I still drew the occasional bit of Furry Art, and the characters still remained alive, begging their tails to be told. Fellowship of the Ringtails is technically furry, although the characters are actually little changed from their earth counterparts in appearance, and mainly anthropomorphic in behaviour. I was also accepted into the Furry Writers Guild, much to my surprise and delight! And, with any luck, will see some of my short stories published in future anthologies. This may encourage me to reincarnate my Furry characters, dust off the manuscripts and get them published! I have also written Poke-morph Fanfiction, and you can read that story here: Pookamon: Quest for Freedom AND it actually IS finished!